Drawing a spiral staircase, or any staircase, is a useful skill to learn for an artist working in any field. Architects and those employed to design staircases may also find the skill useful. Learn how to use basic shapes and simple line work to create a spiral staircase. Start by drawing a straight vertical line down the center of your page. This line will act the as the support for your stairs to wrap around. Loosely draw a spiral around this straight line from the top to the bottom. Don't draw the spiral too steep or too thin and keep your pencil strokes both faint and loose. Thicken the vertical line to give the support some form. Perhaps add a pattern or bespoke design to this pole. In fact, the pole does not have to be perfectly cylindrical. Use the Internet for reference images and have some fun here. Add a line either above or below the spiral line, following it parallel around the central pole. These two lines will act as the top and bottom or your stairs. The top line will be the railing and the bottom line will be the step support. Thicken the top spiral line, although not as much as the central support pole and add a pattern to it also, if you like. Draw horizontal lines jutting out of the lower spiral line at equal intervals from top to bottom. These lines will act as the steps. Use the Internet again--sites like Google and Yahoo! work best--for inspiration on step designs; some can be quite innovative. 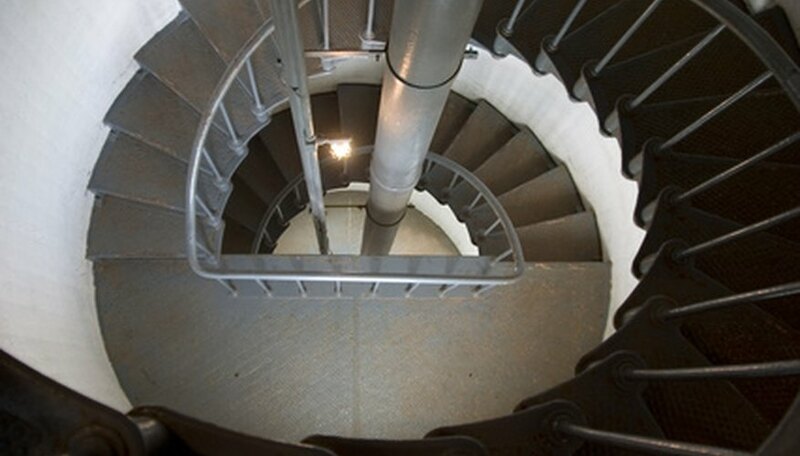 Draw vertical lines between the top and bottom spiral line at equal intervals to act as the spindles of the stairs. Alternatively you may not want many spindles and could want a curved glass spindle. Like the other steps, use reference and your own imagination to create your own unique styles. Keep your pencil lines faint and loose throughout the sketch. Finalize your design and draw over the pencil lines you want to keep with a fine liner pen. You could add color or shading at this point to create a sense of form and three-dimensional space. Color especially will help push your idea and give the image an element of professionalism. Use a technical pencil for cleaner lines. Using marker pens will add an element of professionalism to your image. Pens can leak, so be aware of this. Erasing too much should be avoided. James Tennant is a freelance writer and artist. He works for the Sharedlog Project, Edit Optimisation, Pure Content and Prospect Solutions. He has been a freelance copywriter since 2008 and has worked for such prestigious companies as eBay and Gumtree. James graduated from Newcastle University with a Bachelor of Arts, honors, in ancient history.